• Aug. 3, 2010: Warehouse driver Omar Thornton shot and killed eight people before apparently committing suicide at a Manchester, Conn., beer distributorship. • Feb. 12, 2010: Three biology professors were shot and killed and three other employees injured at the University of Alabama’s Huntsville campus. Amy Bishop, a 42-year-old instructor and researcher at the school, is charged with murder. • Nov. 5, 2009: At Fort Hood, Texas, 13 people were fatally shot and 32 were injured. Army psychiatrist Maj. Nidal Malik Hasan, 39, is charged with 13 counts of premeditated murder. • June 25, 2008: Wesley N. Higdon, 25, killed five workers, then himself, at Atlantis Plastics in Henderson, Ky. A sixth shooting victim survived. • March 18, 2008: Lee Isaac Bedwell Leeds, 31, shot and killed four men at a junk yard in Santa Maria, Calif.
• March 12, 2008: Robert Lanham killed two people in the Regions Bank of McComb, Miss., where his ex-wife worked, then forced the woman to flee with him before killing her and committing suicide. • Jan. 30, 2006: Former postal worker Jennifer San Marco, 44, shot and killed six postal employees, then herself, in Goleta, Calif.
• July 2, 2004: Elijah Brown, 21, killed four co-workers and wounded three others at a ConAgra Foods meatpacking plant in Kansas City, Kan., before committing suicide. • August 27, 2003: Recently fired Salvador Tapia, 36, killed six former co-workers at an auto parts warehouse in Chicago, then was shot dead by police. • July 8, 2003: Doug Williams, 48, shot and killed six workers and wounded eight others before killing himself at a Lockheed Martin aircraft parts plant in Meridian, Miss. • Feb. 25, 2003: Emanuel Burl Patterson, 23, shot and killed four fellow jobseekers and wounded a fifth at a temporary employment service in Huntsville, Ala.
Criminologists call it murder by proxy – rampages by employees who go after their boss, supervisors and even co-workers they link to the source of their outrage. The message is: Look who’s doing the firing now. These eruptions of workplace violence often occur in similarly brutal ways. But experts say they rarely come with a warning, making them hard to stop. Employers can reduce the risk of on-the-job attacks, especially in cases where employees are about to get axed; if there have been signs of distress or aggression, they can move the conversation away from the main work space or have security present. Patdown searches and the use of metal detectors are also options for some companies but have the drawback of raising tension. In the latest outburst of workplace violence, Omar Thornton, a driver for a beer distributor, fatally shot eight fellow workers and wounded two others Tuesday at the company warehouse in Manchester, Conn., then killed himself. Thornton calmly agreed to quit after being confronted with surveillance video showing him stealing beer. Shortly afterward, he started shooting. Nothing in his work history or behavior suggested he would be violent, the company said. Though Thornton, who is black, alleged in a phone call to 911 that he had been racially harassed, his employers and union disputed the claim and said he had never filed a complaint. “Ten seconds before he started shooting, if you had asked me, does he look like he’s going to react in any way? I would have said ‘no, he seems calm,’ “ Steve Hollander, a company vice president grazed by the gunman’s bullets, told the Associated Press the day of the attack. Meetings to fire employees should be carefully planned, taking into account the location, how many people are going to be present and what should be done if there is any potential for violence, said Jim Francis, a senior security consultant at T&M Protection Resources, a security firm in New York. Among the questions to ask, he said: Should an off-duty police officer be brought in for security? If an employee has a violent past, he said, the choices are more clear-cut and the planning easier. “You certainly then ought to expect that there is potential for additional violence,” he said. Heavy security measures can backfire. “Searching an employee and bringing in metal detectors on a one-off basis is probably not something you’re going to do because … you may be inflaming the scenario by playing such a strong card,” he said. Without warning signs – and even with security measures in place – experts say there is little that can be done to stop a determined gunman. “The only way to guarantee you never become a victim of a workplace shooting is to be self-employed,” said James Alan Fox, professor of criminology at Northeastern University in Boston. Investigators say Thornton came to work at Hartford Distributors with two 9 mm handguns stashed in his lunch box, which he placed in the kitchen next to the office where he learned he was being let go. After quietly agreeing to resign, the 34-year-old retrieved the guns, killed two men who had attended his disciplinary hearing, then roamed through the plant and the parking lot targeting other workers. Francis said companies of all sizes need to consider a violence protection plan. In all cases where there’s potential for violence, the interview should be conducted away from the main workplace, employees should be escorted to and from the room and supervisors should evaluate whether “this situation is serious enough that we want security visibly present,” Francis said. Trained supervisors will be aware of the need to avoid angering the employee unnecessarily. Companies should also provide training to help staff understand danger signs in those around them, said Ross Arrowsmith, a senior security adviser with Workers Compensation Board in Alberta, Canada. An average of 63 people are killed each year by a co-worker or former co-worker in U.S. workplaces, federal statistics show. In 2003, recently fired Salvador Tapia returned to an auto parts warehouse in Chicago and killed six former co-workers before being shot dead by police. In 1986, Pat Sherrill, a postal worker who authorities say was about to be fired, killed 14 people at a post office in Edmond, Okla., then fatally wounded himself. After workplace violence, an employer can be held liable for failing to adequately screen job applicants, recognize and take action against problem employees, or provide adequate security. In 1999, a jury found Union Butterfield and Dormer Tools of Asheville, N.C., negligent for failing to protect two men killed by a worker who went on a shooting rampage after he was fired. 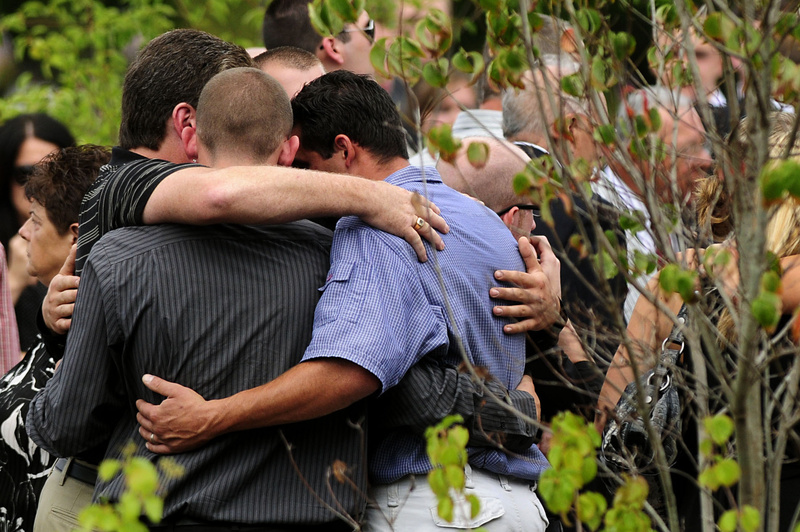 The jury awarded $7.9 million to the families of the slain employees.